Mary Moran (now an MD) had just turned 20 years old and wondered if she’d make it through that day in May. She was sailing on a 30-foot open boat—no cabin below—for 26 days off the coast of Maine with 10 strangers who knew very little about sailing. Dr. Moran was participating in her first Outward Bound course. The organization, which was initially established in the 1940s in Wales and then brought to the U.S. in 1963, focuses on experiential learning, teaching survival skills, self-reliance and self-confidence through outdoor adventures. Since then, Dr. Moran has become Outward Bound’s biggest fan, participating in dozens of other adventures—both on land and at sea—for more than 40 years. She has also volunteered as an assistant sailing and rock-climbing instructor, chaired its national safety committee, and served as a member of its Board of Trustees for 18 years. Next to practicing medicine, she enjoys nothing more than the outdoors and wishes she could treat her patients in the fresh air instead of in an exam room. Dr. Moran was born and raised in Hinsdale, Ill. After graduating nursing school from Marquette University in Milwaukee in 1975 and working in a hospital for several months, she craved to do something different and exciting, something outside of four walls. So she signed up for Outward Bound’s sailing course. Top: Winter Outward Bound programs. 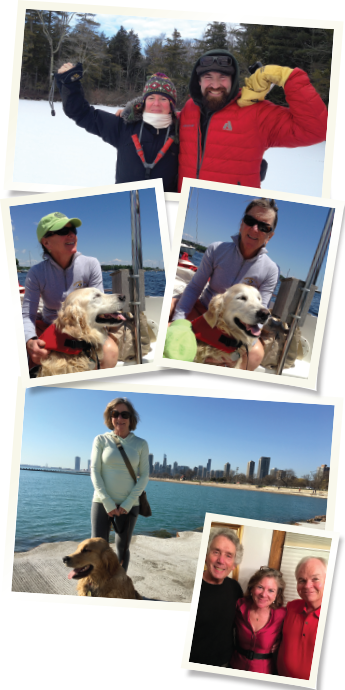 Middle: At sea with Scout, the therapy dog. Above: Training in Chicago. Right: Dr. Moran with her former colleagues from the Illinois Bone and Joint Institute in Chicago, Dr. Gerry Eisenberg (left) and Dr. Patrick Schuette (right). For most of the journey, only one question entered her mind: “What was I thinking?” Her epiphany came late in that adventure while on nearby Hurricane Island—which would become her second home—watching the sunrise with one of the sailing instructors.